Last week’s facebook post linked to jaw dropping photos of Alpine ibex scaling a precipitous dam in northern Italy. As it turns out, the article stirred up a few conversations among our friends regarding mountain goats. The big question; what’s the difference between an ibex, a steinbock and a chamois? The ibex and the steinbock are the same thing. 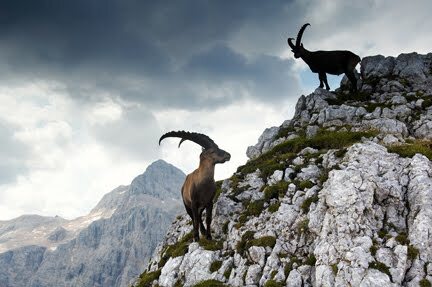 Its scientific name is Capra ibex, a species of mountain goat that thrives in the high places of the European Alps. It’s common name is Alpine ibex. English speakers call him an ibex. Germans call him a Steinbock. Italians call him a stambecco. French call him a bouquetin. Slovenians call him a kozorog. Characteristics: His enormous backward curving horns give him away. The horns of a male ibex can reach lengths of more than three feet. Males commonly grow to about three feet tall and weight between 150 and 200 pounds. Habitat: Steep, rocky terrain at snowline. Check out our Gran Paradiso Trek for an opportunity to get up close with these majestic animals. The Gran Paradiso National Park boasts a herd of more than 4,000 ibex. A chamois is an entirely different animal. Referred to as Rupicapra rupicapra, a chamois is a goat-antelope species that, while originally native to the mountains of Europe, now roams as far of New Zealand. English and French speakers call him a chamois. Italians call him a camoscio. Germans call him a Gämse. Characteristics: Chamois have short, somewhat straightish horns, which hook backward at the tip. A fully-grown chamois reaches a height around 2 and a-half feet and weighs an average of 45 to 65 pounds, considerably smaller than an ibex. Habitat: Steep, rocky terrain at moderately high altitudes. 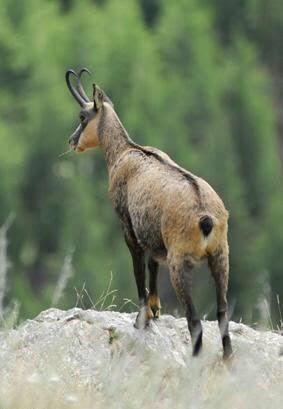 The chamois is a popular game animal in Europe, highly prized for the taste of its meat. Chamois hides also produce a soft cloth with exceptional absorbant qualities. This is where chamois leather, colloquially known as ‘shammy’, comes from. If you’ve hiked with us in Europe, then you’ve probably seen chamois horns adorning the many beer stubes and mountain huts that dot the Alps. Images: Steinbock, (Kozorog), in Slovenia’s Julian Alps. Courtesy of Slovenia Tourism, Tomo Jesenicnik. Chamois in the Val di Rhemes. Courtesy of Val di Rhemes Tourism.